Food to help lower your cholesterol: Maintaining a healthy level of cholesterol is only a shopping list away. We give you a few things to consider while planning to eat a lower amount of cholesterol. The food consumed by people who live around Mediterranean Sea, is predominantly lower in cholesterol. There is no need to think of ‘cholesterol lowering’ as a diet, it’s time to see it as a way of life for the whole family. Cholesterol lowering food such as bouillons and consommé, are filling, generally low in calories and fats, and can provide a completely balanced meal in themselves. They are ideal for relieving that hungry feeling quickly and will also stimulate the digestive juices. This helps increase your metabolism and perhaps you already know that it is better for your body to eat, than to starve in an effort to control weight gain. For a really deep comforting feel to your soup, serve it in a cup. 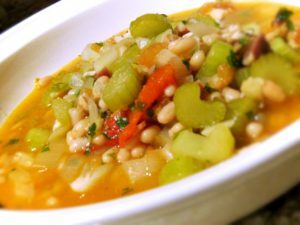 Dry soup mixes are often low in fat and vegetable and vegetable-beef canned soups are very low in fat content too. Always examine the labels. Beef, veal, and lamb are naturally high in both visible and “invisible” fat and cholesterol. You may have noticed that our book Cooking at the Café and indeed here on our website, we only have few recipes for beef, veal or lamb which reflects our European origin. Europeans do not consume vast amounts of meat. Most notably the Meditarranean diet has a balance of vegetables, fruit, fish and meat. 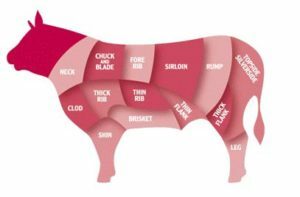 When you are out buying meat, try to keep in mind that there will generally be maximum amount of fat on every cut of meat for reasons of added price, profit and the presumption of “quality.” So for meat to be used as cholesterol lowering food this visible fat must be carefully cut away and trimmed while raw and before cooking. To avoid having to do too much prep work, look for lean meats for the greatest cholesterol lowering benefits. During the cooking, baking, or grilling remove and discard any excess fats. Avoid frying or fried meats. There is often no need at all to add fat to a pan in order to sauté or pan-cook meat. Use olive in oil if need be and turn the meat regularly until it has browned. Pork, bacon and ham are highest in fat and cholesterol content and therefore are not cholesterol lowering food. The same is generally true of sausages, and organ foods like liver and kidneys. If you need to make gravy, try preparing it from the seasoned juices left over from the meat. Once you have removed the excess animal fat, a drop of olive oil and wine will also help to flavour your gravy and retrain your palate. Giving your gravies and sauces more flavour is a great way to help quail the appetite. As well as gravy there are many other ways to pep up your meaty mealand drive that cholesterol level down or maintain it at normal levels: pickles, pineapple, fresh herbs, mint, cranberry and apple sauces, chutneys and relishes. In fact some meat tenderisers are fruit based like pineapple and act to help digest fat so a combination of ham and pineapple for example, will help balance out cholesterol intake. At a typical French, Spanish or Italian family table fresh fruit or salad is always a major portion of a meal that will consist of four to five small courses, and is generally served as the third course after meat or fish and before dessert and finally coffee. 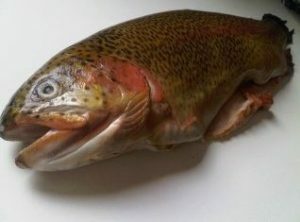 As a rule, fish are often excellent low-fat food sources. 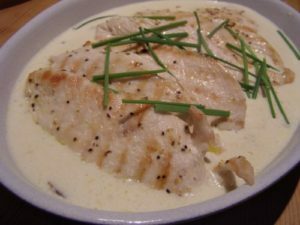 Unlike meats, very little fats will be cooked out of the fish, so attempting to drain off fish fats in cooking is unnecessary. Some fish are especially low in fat, such as perch, haddock, flounder, sturgeon, smelts, scallops. Others like fresh water trout and cod are somewhat higher in fat content, but are still quite low in fat content when compared with meats. Tuna is particularly low in fat and even canned is an excellent choice as a cholesterol lowering food. Chicken and turkey are excellent sources of animal proteins for cholesterol lowering food, provided lean poultry is used. The dark meat of poultry is higher in fat content than white meat. Skin should be discarded. Duck and goose are extremely high in fat and should not be included as cholesterol lowering food. The fat from chicken and turkey, even though much less quantitatively than that in meat, is best drained off and removed in the same manner as in the preparation and cooking of all meats. 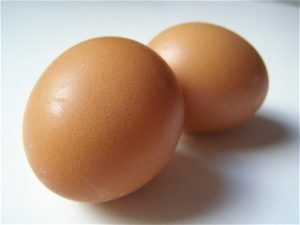 Egg whites, which are proteins are now available from many supermarkets ready-prepared. The yellow portion of the egg, or the yolk, contains one of the most concentrated forms of cholesterol and as part of a low cholesterol diet they should be avoided. One glass or more daily of non-fat or skim milk should be taken. As an added source of fat-free or low-fat protein, skim or fat-free milk can be fortified by adding to each glass of milk one or more tablespoonsful of dried, skim milk. This “fortified” milk also has a thick creamy taste and can be flavored to suit the individual taste with various flavoring agents. Yogurt made from non-fat milk can also be used for nutritious variety. The majority of cheeses are very high in butterfat content and so are not recommended as part of a low-fat low cholesterol diet. There are several important exceptions, however. 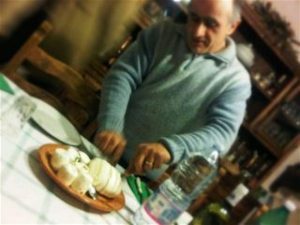 First is ricotta, cottage cheese and generally creamy cheeses are lower in animal fat than hard cheeses – read more about the nutritional values of cheese here. If you love cheese like we do, we suggest you use strong cheese to cook with like Pecorino in favour of Parmesan and Extra Mature Cheddar in favour of mild. By doing so you will use a lot less and it’s budget friendly too. Vegetables are virtually fat free and contain no cholesterol. Choose olive oil seasoned with a little salt, lemon and pepper in place of butter for mashed potatoes for example, or for sautéeing. 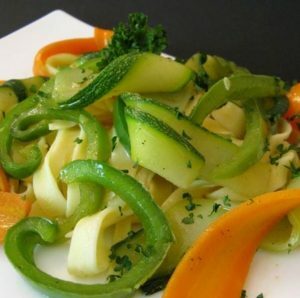 Since many of the vital vitamins and minerals in vegetables may be destroyed by cooking, the ideal use of raw vegetables is the most desirable for any menu, and especially for cholesterol lowering food. The addition of herbs before serving the vegetables adds further to the natural flavour. Fruits also contain virtually no fat and are entirely free of any cholesterol. Two notable exceptions, however, are the avocado and the coconut, which are both very high in fat content and thus should be avoided. Otherwise there is no restriction on the use of fruits, which are also certainly ideal for desserts. Use raw vegetables almost exclusively, since the vitamin value is at peak this way, and the crispness of the vegetables is most appetizing. No fat or cholesterol is concerned unless specifically added. 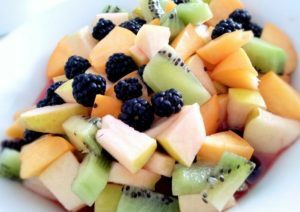 Fruit salads are in the same category and are particularly refreshing and nutritious. We have found that taking a little extra time to dice the fruits seems to make it more appealing. The following garnishes are particularly nutritious and appealing: watercress, garlic, chives, pimiento, lemon, lime, orange or tangerine (be sure to include the zests) and other fruits, mint, carrots, beetroot, green onions (spring onions), celery, radishes, cottage cheese, parsley, pickles and peppers, ketchup, vinegar, non-fat yogurt, fresh herbs, and spices. Cereals take longer for your body to digest and release energy at a slower rate to keep your body in better balance. Cereals are nutritious, energy producing, and virtually fat free. Therefore, all cooked or dry cereals like porridge oats are excellent carbohydrate foods, if served with non-fat milk. The taste is enormously enhanced by the addition of stewed or fresh fruits such as bananas, prunes, peaches, pears, apricots, berries, dates and figs, raisins, or baked apple. Whole wheat and whole grain cereals are also an important source of vitamin B complex and protein in the low-fat diet. 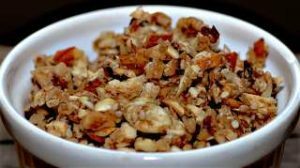 For those who work and feel best beginning the day with a substantial breakfast, the inclusion of a cereal, skimmed milk, fruit, and wheat germ “combo” is excellent for energy, proteins, vitamins, and minerals. Try snacking on a power bar to get everything you need. Both white and whole wheat breads contain only a negligible amount of fat (approximately 5 per cent by weight) a minority quantity of protein (about 20 per cent); the rest is carbohydrate. Whole wheat bread is the healthiest, most nutritious form. 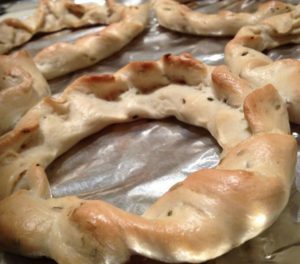 Bakeries customarily incorporate some lard, butter, or egg yolk in most yeast loaf bread, sweet rolls, rolls, muffins, buns, and coffee cake. Therefore, the most healthy alternative if you prefer a nice range of choice for your bread, is to seek out your local farmer’s market and/or, make your own bread! It really can be fun for the whole family. A wide choice of fat-free drinks is available to all, such as tea, coffee, coffee substitutes, skim, fat-free milk, non-fat milk cocoa, skim milk powder shakes, and egg white eggnogs. Where desired for additional nutriments, flavouring can be added to these flavoured skim milk drinks in between meals or at bedtime. We don’t want you to get too hung up on a dramatic change to your diet, we do however recommend that you choose to eat more foods that lower your cholesterol. 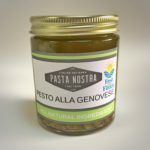 What can I do with pesto sauce?